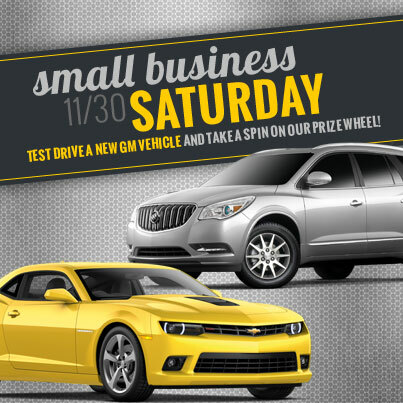 Bill Harris GM (http://www.billharrisgm.com) will be celebrating Small Business Saturday on November 30 by giving visitors to their showroom the opportunity to win one of many great prizes, including the chance to win up to $500. All visitors to Bill Harris GM need do is take a spin and take a spin: test driving a new GM vehicle on Saturday, November 30 will earn an opportunity at the prize wheel, where customers can spin to win gift cards to area businesses, free oil changes and car washes, or a chance to win up to $500. “We at Bill Harris dealerships live by our core values; it is who we are, it’s our culture and one of our Core Values is that we must be a key member of our community,” says Scott Harris, General Manager of Bill Harris GM. No purchase is necessary to win; limited quantities available on a first come, first serve basis. All prizes are locally sourced in observance of Small Business Saturday, which was founded in 2010 as a way to encourage consumers to support local businesses on the day after Black Friday. For more information on the event, please contact Katherine Bargar, Customer Service Director, at (419) 289-2000 Ext. 161.